Cubicle curtains are flat. Industry standard is for curtains to be at least 10% wider than the track size. Add 10% to your track size to determine the width of your curtain. If you are in between sizes, go to the next larger curtain size. Cubicle curtains usually finish 12” – 15” above the floor so they provide privacy but are out of the way for cleaning. Measure your floor-to-ceiling height and subtract 12” to get your curtain height. Our curtains are priced at 6” intervals in height. If you are ordering a curtain for a dressing cubicle, you may wish to have the curtain finish closer to the floor. If fire sprinklers are present, fire code requires a mesh header on the curtain or PVC drops or beaded chain drops so as not to restrict water flow from the sprinklers in case of fire. NOTE: The fabric width is narrower than the finished shade tube on continuous loop shades. For inside mount shades (to be installed inside the window casing or frame). 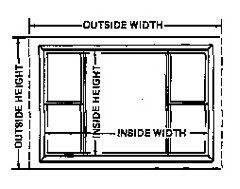 Measure the exact inside width of the window frame from one inside edge to the other. For blackout shades, Covoc recommends selecting the side channel option for inside mount. This will block out any light that would normal filter in through the gaps on the sides. Make no allowances for outside mount blinds For inside mount shades (to be installed inside the window casing or frame). There will be a small light gap on each side of inside mount blinds, PLEASE NOTE: The minimum depth required to mount the horizontal mini blind inside the window frame is 1-3/4". BE SURE TO SPECIFY YOUR DESIRED CONTROL POSITION. UNLESS OTHERWISE STATED, THE LIFT CORD WILL BE PLACED ON THE RIGHT, THE CONTROL WAND WILL BE PLACED ON THE LEFT. Measure the exact height of the window (check it in 2 places for accuracy). Measure the exact height of the window.